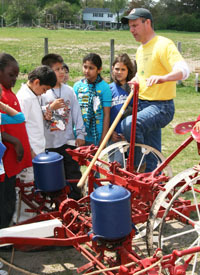 Wagner Farm has reached the milestone of one million visitors since 2002. Congratulations to them and to the Barnett Family of Skokie who were the millionth visitors! Visit one of the few remaining working dairy farms in Cook County. The farm provides a unique opportunity for families to learn about our farming heritage and experience first-hand “the way things used to be.” See the crops & animals in a 1920's era homestead. Interactive stations, milking parlor, greenhouse, authentic 1930's store and old-fashioned soda fountain.